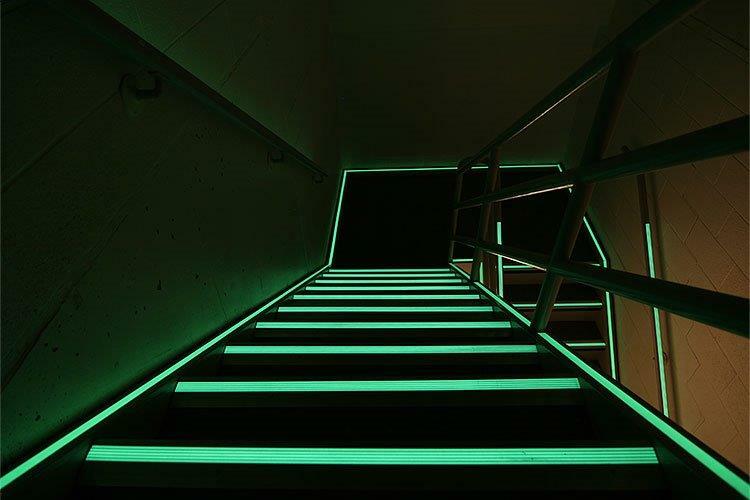 Photoluminescent Egress Markings is a system of exit signs and pathway markings used to help illuminate steps, landings, handrails and other obstacles in low visibility, smoky conditions. The products we use come from Ecoglo whom provides a fail-safe visibility in emergency conditions and allow the efficient movement of people, 24 hours a day. Ecoglo products are ‘visibly better’ with their bright, long lasting glow and outstanding durability, indoors or outdoors. 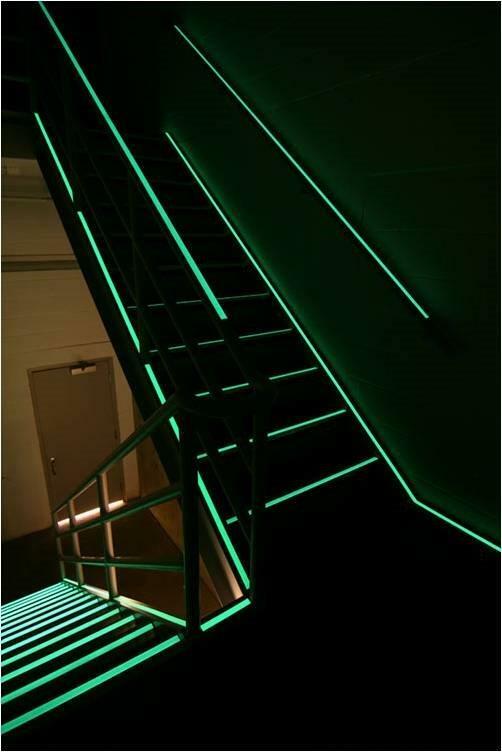 Our ecoglo photoluminescent products meet the compliance guides for safety codes; in particular 2012 NFPA 101 for exit stair path markings and IBC/IFC 2009 luminous egress path markings code requirements. Read Code: 2012 NFPA 101 and Code 2009 IBC/IFC. In a patented process, custom-blended photoluminescence and non-slip silicon carbide material, in standard and custom colors, are heat-fused to high-grade aluminum strips. 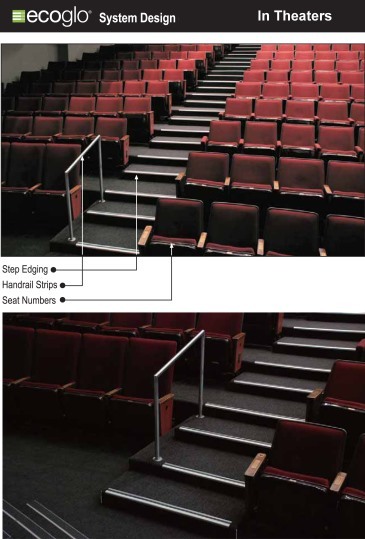 The result is a contrast strip that provides high contrast and superior visibility and durability when applied to concrete, steel, aluminum or wood steps. For the safe way-finding out of public facilities, the emergency egress signs, UL924 exit signs, aisle markers and seat markers incorporate photoluminescent pigments that are bonded to aluminum sheet stock. Designed to be walked on, the signs have a durable anti-graffiti coating to provide continuous, trouble-free performance to last the life of the facility. 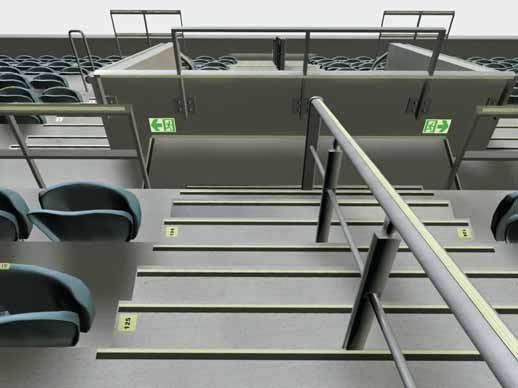 The modular design of the stair nosing profiles enable the easy insertion of contrast, non-slip strips or photoluminescent strips in 38.1 mm (1.5 in) and 50.8 mm (2 in) widths. 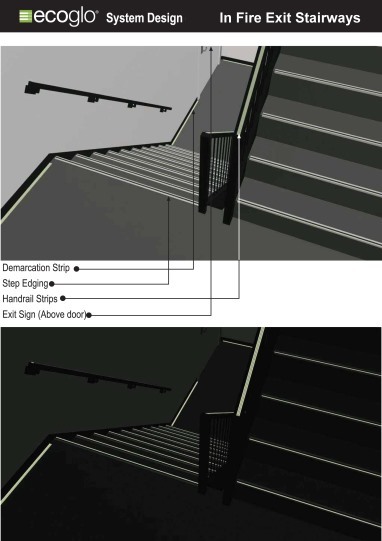 Flat stair nosings are for flat step surfaces, carpet stair nosings are for low and high pile step installations and cast-in-place step inserts are for newly poured concrete steel pan steps. 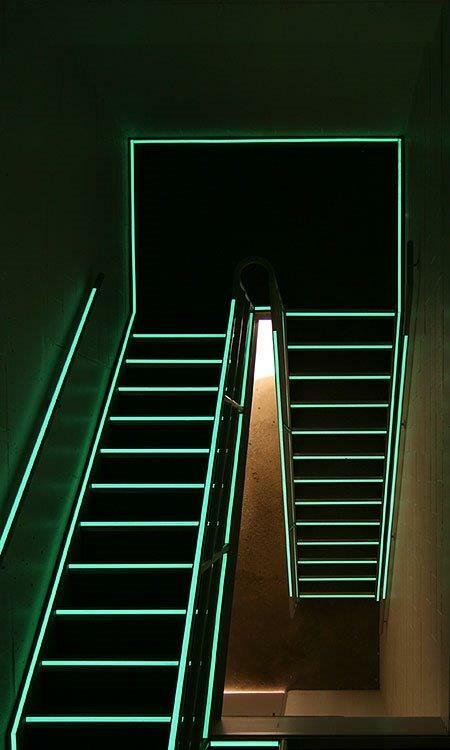 Photoluminescent pigments are bonded to aluminum strips to create guidance and handrail products for radius or flat application on stairway landings, handrails, door frames, hallway baseboards or physical obstructions to provide a continuous long-lasting luminous light that is vital to the safe and efficient egress of people from public facilities. 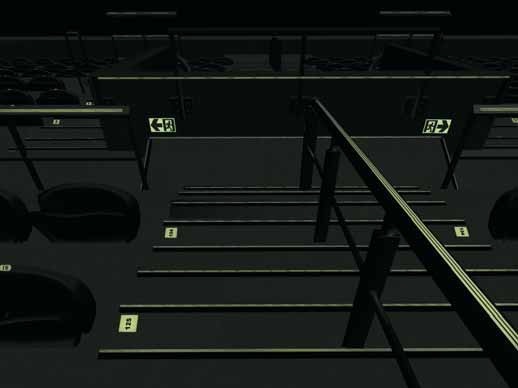 The Ecoglo Photoluminescent (PL) range of products provide significant benefit during low light conditions and emergency blackout situations. With a proven track record in reducing slips and falls Ecoglo products provide improved health and safety with additional benefits in any smoke hazard situation. Used for way-marking, step nosings and signage, the products are UV stable and highly durable, lasting for many years. The products are easily installed and have minimal maintenance costs.